The first look at Captain Marvel has landed! True, we'd gotten a candid pic snapped while Larson was on set several months ago, but A, that suit was rather, well, green, and B, it wasn't an official pic. These first-looks are much higher quality, and the color scheme matches the character's current appearance in the comics. Which many speculated to mean a trailer would be imminent. Unfortunately, such was not the case, but while we don't get to see Captain Marvel in motion / action, that doesn't mean we can't appreciate her absolutely, well, marvelous costume, plus a few details on the plot. 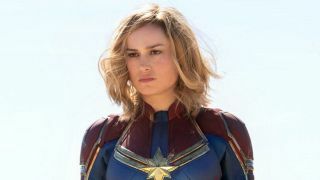 According to EW, the film will start with Carol Danvers (that's Captain Marvel's civilian name) already having her superpowers, joining up with an intergalactic team known as Starforce. Although not confirmed, it's rumored that Jude Law is playing Mar-Vell, the team's leader, and who Carol gets her powers from in the comics. After spending time with Starforce she'll head home to take on the film's baddies, the shapeshifting alien race known as the Skrulls. But questions about what those fights will look like, what happens to Carol, why her suit changes colors, and why she had to be reached via beeper at the end of Avengers: Infinity War will have to wait. Be patient, friends. Captain Marvel is coming. If that isn't enough Marvel-ous goodness for you, why not check out every new Marvel movie coming soon, as well as all the best Marvel movies.